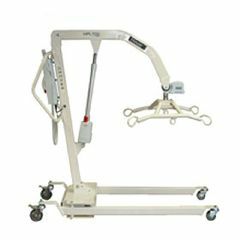 he Hoyer HPL700 Patient Lift is a uniquely designed electronically operated patient lift for the safe lifting of heavier patients. It is both sturdy and robust with a safe working load rating of 700 lbs. The HPL700 has been designed to be configured with or without a weigh scale. The weigh scale is seamlessly integrated with a digital display on both sides and user-friendly controls. The powered base allows the legs to be opened and closed with the push of a button, no need to bend or twist to adjust the legs. It also has two batteries and a charger included and the batteries have visual and audible low-battery indicators.